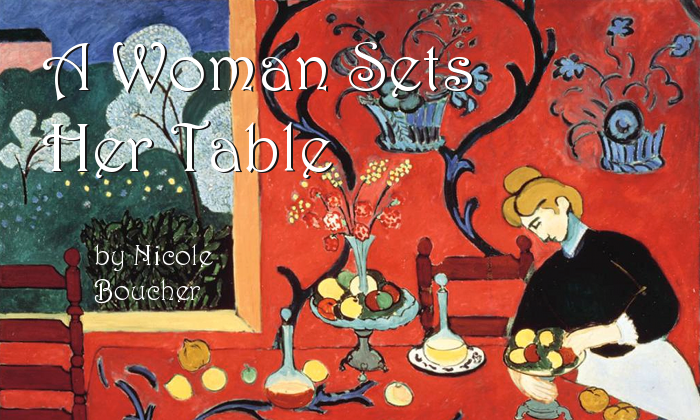 Once upon a time, a woman set her table for a beloved guest. She had hoped to see him for some time, and she thought today might be the day. She swept the floors, dusted the furniture, and tied a clean apron over her simple dress. The dining table looked pretty, with plain but spotless dishes, fresh linens, and a couple of mums stuck in a jam jar. Bread was baked to serve with tea. The woman hoped that the guest would feel welcome and comfortable. She waited with happy anticipation. Then, she waited calmly. As the guest continued to not arrive, she fed her family a midday meal in the kitchen, and then waited a little anxiously. The woman’s sweet husband noticed her distress, and he took her in his arms and held her close. Very close. So close that he pulled her gently into their bedroom for a while, because he knew how to make her happy. When they were done, the woman washed and put on a new dress, one embroidered with stars. She looked at the table, and decided to make a salad and savory tarts to go with the bread. She reset the table with a nicer set of dishes, the ones with a wheat design around the rims. Surely, she thought, her guest would enjoy a real meal and the lovely setting. Perhaps more flowers would please him, too, so she threw on a shawl and stepped out into the cool, autumn air to gather some. Her garden was past tulips and daffodils, of course, but there were purple and blue asters, orange chrysanthemums, and rust heleniums. White and yellow roses were still living as well, and she made a proper bouquet of them. It was mid-afternoon now, and the woman walked a little stone path to her gate holding the bouquet, to gaze down the road in both directions, but there was still no sign of the guest. She sighed. Her children, who had been playing outside, saw her sadness, and each one grabbed an arm and pulled her back into the garden to play tag and roll in fallen leaves, because they knew how to make her happy. When it was time to go inside, the woman put the flowers in a vase on the sideboard, brushed the leaves out of her hair, and put on a clean dress, the blue one with red flowers that she saved for holidays. She stood in front of a mirror, and put on the earrings her husband had given her, and the beads her children had strung for her when they were little. Voices came through the door. The guest had finally arrived! It was the neighbors, though, friends from childhood, and not the guest. They had brought over a peach pie. Hiding her sorrow, the woman greeted her friends warmly, and opened a bottle of good wine to share. The house was growing very cool, but she wanted to leave the door open in case the guest arrived. When the friends learned about him, they clucked their tongues and embraced her and talked to her, because they knew how to make her happy. It was suppertime, and the guest had still not arrived, but there was bread, salad, tarts and pie, and a houseful of hungry people. She suddenly felt very happy, so the woman reset the table, putting out the best, most festive dishes, ones with a horn-of-plenty pattern. She lit candles, placed the roses as a centerpiece, and brought the food in. Then she noticed that there was only one place left at the table, the place she had hoped the guest would fill. The woman felt sorrow for his absence so strong it took her breath, and she was afraid that the sorrow would never leave, but she also saw her people gathered and waiting, and she knew she must sit, herself, in the empty chair. So she approached, sat, and held her hands out to her beloveds, but not before shutting the door at last, because it is hard to keep a door open when all that’s coming through it is a cold wind.